In stock. Order in the next 1 hour, 45 minutes and it will go out today! 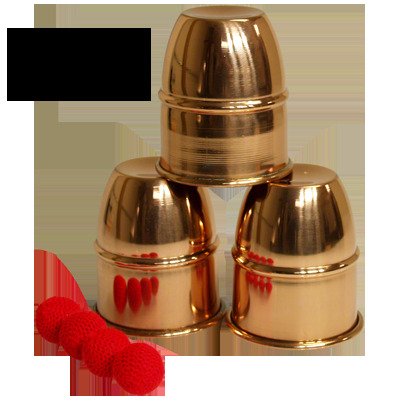 For those that like to add that little bit extra to their standard Cups and Balls routines, this copper combo set includes two regular cups and one gimmicked. Perfectly able to be used for a standard routine, the gimmicked cup, (commonly referred to as a Chop Cup), has a magnet inside and when a magnetic ball is used, the ball will stick inside to the top until the cup is set down with a little bump to the table, which releases the ball. Used to show no ball beneath the cup, with a magical appearance of the ball at will when the cup is lifted after the 'bump'. Jesse asks: Is there also a megnetic ball included and if yes how many. Or are all of them magnetic? 1. Vanishing Inc. Magic responds: One of the four balls is gimmicked, the other three are normal. This is the standard that combo cups come with. A beautifully crafted brass version of the classic chop cup.